Friends of Tibet in association with Daira Centre for Arts and Culture and Hyderabd GTsokpa organised World Tibet Day Celebrations in Hyderabad, Andhra Pradesh on July 6, 2016. The organising team reached the art centre at 11:30am. The members of the Hyderabad GTsokpa arrived in batches of four, carrying with them steamers and other utensils and food items. One team started to decorate the gallery by placing the photo of His Holiness the XIV Dalai Lama's and arranging the space for the morning prayers. The Tibetan Prayer Flags were the cynosure of the eye. The other team got busy manning the kitchen. Cooking for the prayer started. The student community prepared the venue for the prayer. Resonating prayer chants followed for the next 30 minutes. Next, the traditional Dresil, cooked during Losar, the Tibetan New Year was prepared with rice and butter, seasoned with raisins, almonds and other dry fruits. Followed by Dresil the stupendous task of making 600 odd momos for the guests was initiated. Momos, the Tibetan delicacy, was a major highlight of the event. Team Hyderabad GTsokpa started working on the Momo right after lunch; for around 65 guests expected the team had to make around 500 momos, which was indeed a tall order. But when the programme started there was a spillover of 85 people. Our happiness knew no bounds, but it certainly pushed up the momo count. The open kitchen at Daira was a pool of energy: Music, singing, snacking — the team was on a rollercoaster ride. Tibetan medicines and books by His Holiness the XIV Dalai Lama was also available at the reception of the gallery. 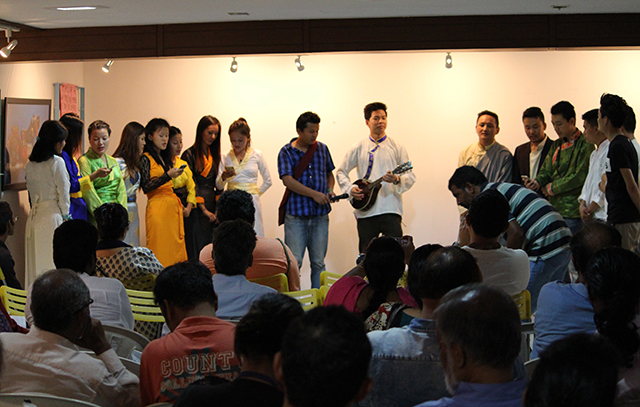 The evening started with the Tibetan Prayer chanted by the Hyderabad GTsokpa team. The hall reverberated with the soulful chants. Atiya Amjad, Founder-Director and Curator of Daira Centre for Arts and Culture welcomed the audience. Next, the traditional Tibetan butter lamp was lit to mark the World Tibet Day. Dr Ngawang Gelek from the Men-Tsee-Khang, Hyderabad and Prof Shanti Swaroopini, artist and sculptor, lit the lamp. Soon after, the hall resonated with "Happy Birthday Dalai Lama"! Tenzin Yongdue from the Hyderabad GTsokpa spoke about the World Tibet Day. She shared how Richard Rosenkranz came out with the idea of celebrating His Holiness the XIV Dalai Lama's birthday as World Tibet Day. She also read out the objectives of World Tibet Day. Eswar Anandan, poet and campaigner of Friends of Tibet recited four of his poems on Tibet from his forthcoming book with the same title: Tibet. The recitation was followed by a minute's silence, observed as a mark of respect for the brave souls who self-immolated themselves for the cause of Tibet. Tenzin Chomphel, founder of Hyderabad GTsokpa spoke about the Tibet issue and quoted His Holiness the XIV Dalai Lama. His address was followed by a popular Tibetan song 'Sungta Lemo So' by the members of the Hyderabad GTsokpa. Later Atiya Amjad announced 'Project: Route to Tibet'. She invited artists, art students and art enthusiasts to participate and submit their paintings which would reflect the artists' feel for Tibet. Artist and Sculptor Prof Shanti Swaroopini launched the project by releasing the posters. Participants of 'Project: Route to Tibet' can submit one, 2x2 ft. painting on canvas, expressing their feel for Tibet and HH the Dalai Lama. The entries should reach the Centre by August 12, 2016. Participation is free and open to all. The highlight of the evening was the screening of Martin Scorsese's masterpiece 'Kundun'. A biopic of the XIV Dalai Lama, tracing the story from his divine recognition to the time when he was forced to leave Tibet. The hall was well occupied to begin the show. Earlier the birthday cake for His Holiness was cut by one of the prominent supporters of the city, retired IPS officer, Anjaneya Reddy. After a 20 minute break for the delicious momos, the screening of 'Kundun' continued. Dr Ngawang Gelek from the Men-Tsee-Khang Hyderabad thanked the organisers — Friends of Tibet, Daira Centre for Arts and Culture and the Hyderabad GTsokpa for initiating and organising the event. Phula Tsering, President, Hyderabad GTsokpa proposed a vote of thanks. The National Anthems of both India and Tibet were sung by one and all. After seeing off all the guests the organisers came together for a group photo. World Tibet Day 2016, Hyderabad celebrations were well organised and well attended. We were overwhelmed by the response received. * Thupten Tsewang, Vice President of Hyderabad GTsokpa, played Master of the Ceremony. * Young ladies wearing colourful traditional Tibetan attire posed for the Media. * The reception counter at Daira Centre for Arts and Culture, manned by the members of the Men-Tsee-Khang, Hyderabad clinic, was the central point of information Press Releases, World Tibet Day material, Tibetan Medicines, Books by His Holiness the XIV Dalia Lama, guest book were all available at the counter. * The silent support, T Laxminarayana, Resident Artist at Daira, Hyderabad made sure that the hall was well arranged.